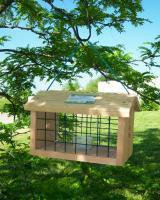 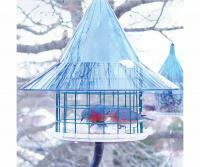 This feeder is designed to protect not only bluebirds, but all smaller birds. 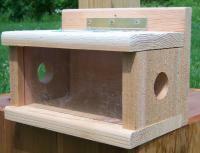 Entrance holes on the end allow little ones in, but keep starlings and other large birds out. 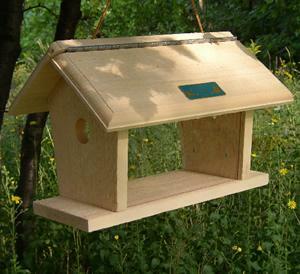 Extended landing platform provides outside perches at each end. 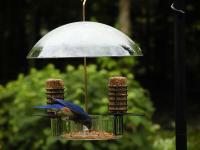 Bluebirds feed inside on berries and fruit, or mealworms and insects. 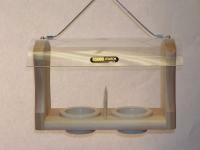 Top swings up for easy filling. 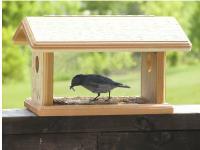 Mount on a post, pole or hang from attached cord.